oh, man, that's one of my favorite quotations. Who said it anyway? Mark Twain or something? I can picture the creator of this sign flipping through the index of Bartlett's Book of Quotations: "Ice cream...ice skating...here it is! Ice trays." Sounds like a paraphrasing of that scene in 6th Day. 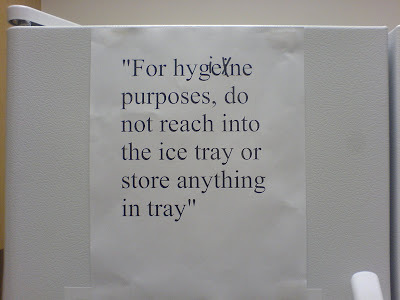 I love that someone went to the trouble of correcting the spelling of "hygiene," but didn't bother to remove the quotes. This made me laugh a lot. It is the comment that makes it. As if to say, "It's what my boss told me to say, not what I want!!"